Chuong was the first Completer of the Center he studied in. His motivation for completion was to be good at Math and to explore more about this subject. Back to the time when he was preparing for the entrance examination of Tran Dai Nghia, a gifted school in HCMC, he did not face neither difficulties nor pressure of exam like other students. At that time, he was studying Level O, Math contents of Grade 12, therefore, his Math knowledge was quite strong. He studied on his own by practicing sample tests instead of joining exam preparation classes. After passing the exam, he is currently studying in his dream school and his Math grades are always top of the class. He can handle Math assignments with greater ease and speed. Thanh is a smart and industrious boy. Since he was 1, he showed his interest in numbers and could count to 100. Being aware of Thanh’s ability, his mother enrolled him in Kumon when he was 3. 3 years later, he studied 4 operations of fractions and decimals, Grade 6 Math, when he was a few months into Grade 1. For his mother, Kumon is far beyond Math. It has brought him meaningful and exciting experiences through the advanced learning journey. In the Advanced Student Forum last year, Thanh was honored for advancing 5 years beyond his school grade level. 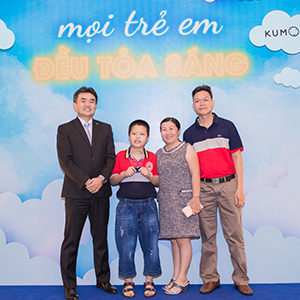 This is the first time that Thanh has achieved the award so he and his mother are really happy. His efforts coupled with his Instructor’s and mother’s support were paid off. After only 1 year, he was able to increase the achievement from 3 years to 5 years ahead. Thanh’s enrollment was resulted from a business trip of his father years ago. In that trip, his father was highly recommended about a Japanese method of learning Math, Kumon. Convinced about its benefits, his father let Thanh experience learning Math with Kumon. 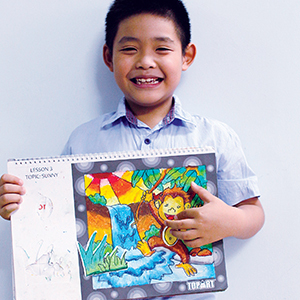 Enrolling at an early age, Thanh initially encountered some certain difficulties. His low pencil skill was a challenge. He needed much time to get through each new learning focus. It was not until 3 years later that Thanh discovered he loved Math and truly had potential in it. Practicing the piano and other sports gave him spiritual and mental strength. At Grade 3, he was commented to achieve a turning point in all aspects. He was no longer timid about what to do. His calculation ability was so good that his classmates called him “Math genius”. 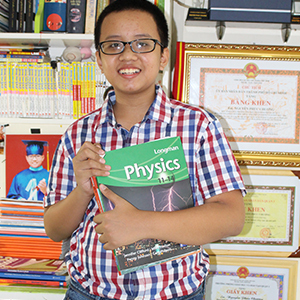 He also challenged himself with Math Violympic, an online contest, and won the first prize in the district for both English Math and Vietnamese Math rounds. In addition to Kumon worksheets that were five-year beyond his grade, Thanh was eager to explore Math further through reference books and the Internet. At present, Thanh is a 7th grader at Tran Dai Nghia, a school for the gifted in HCMC and is about to complete Kumon Program (Grade 12 Math). He dreams to become a Math teacher so that he can share his knowledge and experience of studying it with everyone and further he could invent a new Mathematical theorem. “I don’t think that learning math is for test only. Through what I experience, I believe math gives us great skills such as logical thinking and problem solving all of which extend well to our job in the future and help us work more efficiently. Kumon Math does not emphasize the complicated reasoning but rather strengthens children’s skills in deriving the numbers and mastering the calculations. And that’s exactly what Minh at his age needs, not the super hard and complicated math questions”, said his father. As Minh has had a solid springboard since young, coupled with his father’s supportive parenting, he makes an amazing progress when advancing to Level J (Grade 10 math), 5 years beyond his school grade level, after only nearly two years of learning with Kumon. Not only does he do really well at Kumon, he needs under 5 minutes to finish 45-minute tests in math, computer science and English at his school. What makes his father most proud of him is not his impressive achievements but his skills in working independently. What Minh reads and self-learn every day is much higher than children of his age. 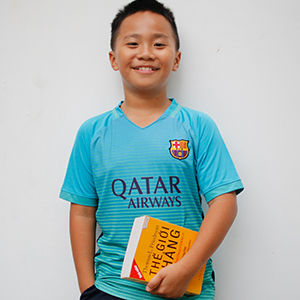 Besides studying, Minh participates in sports and he is now a member of HCMC table tennis team. Last year, his team won the silver medal in the national children and teenager table tennis tournament held in the northern province of Bac Kan.
About two years ago, one of my acquaintances whose daughter completed Kumon Math Program and is currently studying abroad told me about Kumon. I was quite impressed to know that thanks to learning Kumon since young age, that girl could self-study and manage her own learning effectively. I found this method beneficial for building work skills for my children and I wanted them to have good Math competence as well, so I enrolled my daughters. Ha started at four and a half. I still remember that her starting level included reciting numbers and basic pencil control skills which were quite fun. Therefore, she did the worksheets eagerly and excitedly. I even recorded a video in which she was singing along while doing homework. After their 2 years of learning, I feel my daughters are more confident with Math and have good logical reasoning skills. The form teacher at school comments that Ha is a top Math learner in her class. Her classmates even give her a funny nickname, “Math boss”. I also find Kumon worksheets helpful. For every new learning concept, examples and hints are given, clearly showing how to solve the problems. Using that guiding function from the worksheets, my children can do homework on their own and rarely ask for help or teaching every step. So far, I have been satisfied with their progress, skills and achievements. I also recommend Kumon to other parents and encourage them to enroll their child at the early age, from four is the best, I think.